Back then, Slaughterhouse-Five was not my favorite Vonnegut novel. My favorite was Cat’s Cradle, which I thought was hilarious. I’m not sure now what my reservations about Slaughterhouse-Five were all about. I probably thought that it was too “shaggy” — It seemed at the time to have too much superfluous plot elements (including alien abduction) that detracted from the main gist of the story. My recent rereading revealed a much more coherent novel, and obviously a masterpiece. 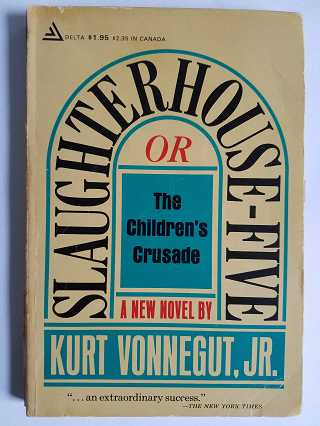 Slaughterhouse-Five is a novel that requires some background about the author, which he provides in the first chapter: During the latter months of World War II, Kurt Vonnegut was captured by the Germans, and he and other prisoners of war were transferred to what was considered the safe city of Dresden. They were housed in an abandoned slaughterhouse labeled Schlachthof-fünf. About a month after they arrived in Dresden, the city was horrifically firebombed by British and American air forces, and the prisoners of war were then used in the cleanup operations. After many years of struggle to write a novel about Dresden, Vonnegut constructed a narrative around a POW named Billy Pilgrim, who becomes “unstuck in time” and hence can bounce around to different times in his life. To Billy Pilgrim, time is a navigable fourth dimension much like the other three dimensions. This is explained to him by his alien abductors, the Tralfamadorians. At first the time travel seems like a literary device because it allows Vonnegut to tell the story of Billy Pilgrim without the imposition of chronology, saving the big event of the fire-bombing for the novel’s end. But with what we now know about the psychological effects of trauma, it assumes a much different function: By bouncing around in time, Billy Pilgrim effectively experiences dissociative episodes that help him escape the trauma of his capture and the fire-bombing, and flashbacks that throws him right back into it. The second article cited above discusses Vonnegut’s very likely post-traumatic stress disorder (PTSD), a phrase that didn’t enter our vocabulary until at least a decade after the novel was published. The Tralfamadorian rejection of free will is what allows Billy Pilgrim to accept his fate without going mad (except the madness of believing in his abduction to Tralfamadore to begin with). Slaughterhouse-Five is a war novel, but one that contains not a shred of heroism, courage, or glory. It is instead a parade of death, disease, and decrepitude, and if it weren’t for Vonnegut’s light touch of irony and comedy, it would be unreadable. That “So it goes” refrain appears over a hundred times in Slaughterhouse-Five, whenever required to mark the death of a person, or group of people, or even abstractions like the death of the novel. It’s supposedly a Tralfamadorian phrase intended to reflect a nonchalant attitude to death based on the concept that in some other time, the person is still living. Yet, Vonnegut was witness to the aftermath of a fire-bombing, including finding “seeming logs lying around. These were people who had been caught in the fire storm. So it goes.” (page 154) Those experiences emphasized the finality of death, so the phrase becomes Vonnegut’s wry subversive commentary on the attitude of people who don’t regard war with the horrified reaction that it deserves. Perhaps the biggest shock I encountered in rereading Slaughterhouse-Five was on the copyright page before the novel even began. Permission is acknowledged for quoting from a 1963 book entitled The Destruction of Dresden by the English historian David Irving. That name would have meant nothing to me in 1970, but today, David Irving is widely known as a Holocaust denier. Prior to the publication of The Destruction of Dresden, the fire-bombing was not well known to the English and American public, and then Dresden became notorious. According to Irving’s book, 135,000 people died in the fire-bombing, which put the death toll higher than the atomic bombs dropped on Hiroshima and Nagasaki. It is now believed that the actual death toll in Dresden was more like 25,000 to 35,000 rather than 135,000, and that David Irving had deliberately inflated the figure to manufacture sympathy for Nazi Germany as part of an agenda that also included Holocaust denial. The lower figures still represent a shocking number of deaths, but not nearly as high as the two atom bombs dropped on Japanese cities and the firebombing of Tokyo. Vonnegut’s uncritical citation of David Irving in Slaughterhouse-Five, and his use of Irving’s exaggerated figure of 135,000 deaths, are certainly stains on the novel that weren't even evident fifty years ago. But I wonder how much influence Irving’s book had on Vonnegut’s drive to write Slaughterhouse-Five. When Vonnegut discovered that he was present for what Irving said was the largest single massacre in the history of the world, did that give him the final impetus to get his own story on paper? In other words, could David Irving be responsible for inspiring one of the great antiwar novels of our time? How weird is that?